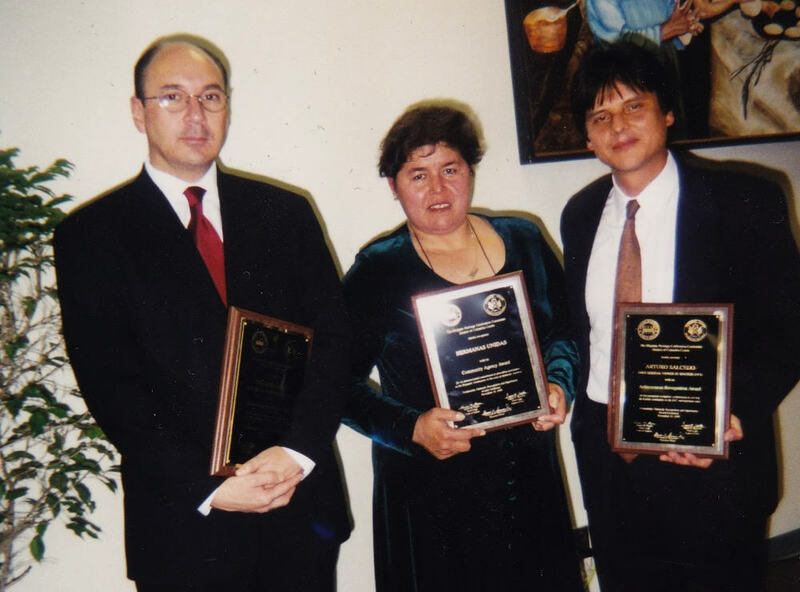 Eduardo López, producer of the television series Línea Directa, Gloria Alemán, member of the domestic violence support group, Hermanas Unidas, and Arturo Salcedo, host of Línea Directa, receive a public service award from the court system in the District of Columbia (1999). The D.C. court system has presented 1999 Hispanic Heritage CORO Awards to the founders and producers of a public service program aimed at educating the Latino community and to a nonprofit group that provides assistance to victims of domestic violence. CORO stands for Community, Outreach, Recognition and Opportunity. The winners were honored for their service and dedication to the Washington area and, in particular, to the area’s Latino community. The recipients included Eduardo López and Arturo Salcedo, both of Educational Video in Spanish, Inc. who for the past 15 years have produced informational videos in Spanish about issues in the Latino community such as child safety and health, police relations and race relations. Their program, “Linea Directa,” is telecast weekly on the local affiliate of the Spanish-language network, Univision. Also receiving an award was Hermanas Unidas, a support group for women who are victims of domestic violence. Hermanas Unidas is a project of the Ayuda agency in Adams-Morgan. Sylvia Garza, the supervisory community outreach specialist of the victim and witness assistance unit in the U.S. attorney’s office, was another recipient. Also receiving an award was Claudio Grossman, dean of American University’s Washington College of Law. He is the past president of the Inter-American Commission on Human Rights of the Organization of American States. The commission judges complaints filed by alleged victims of human rights violations in the Americas.